William Tong speaks to the New Canaan DTC about his U.S. Senate hopes. 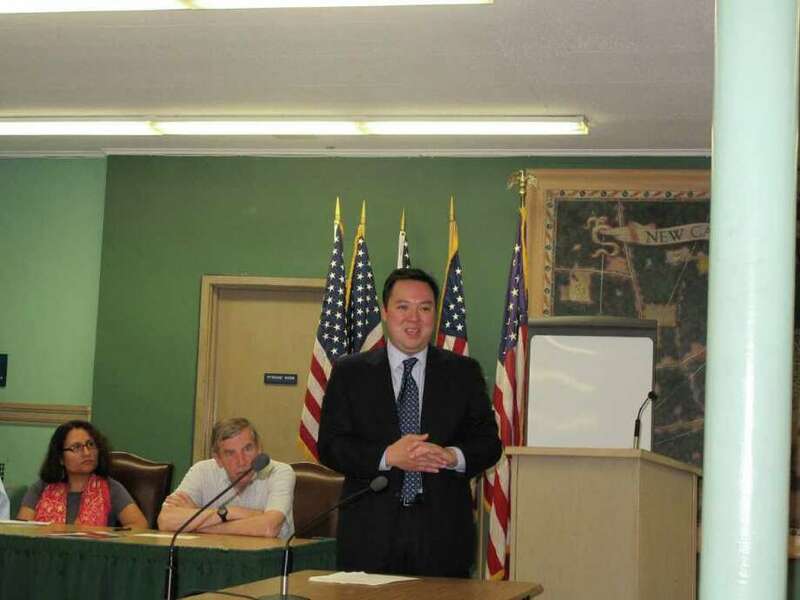 State Rep. William Tong, D-147, last week spoke to the New Canaan Democratic Town Committee about his 2012 U.S. Senate campaign. The campaign, which has already raised more than $550,000, has been making some noise on political blogs and websites, including Politico and CQ Roll Call. "I raised more than $550,000 in 50 days," Tong, who announced his candidacy May 11, said. "It's just over half a million in half a quarter and it is sending a very important message on Politico, on Roll Call and various political blogs and newspapers across the state that this campaign is really picking up steam." He is attempting to seek a Democratic nomination for a seat being vacated by Joseph Lieberman and faces some stiff competition from former Connecticut Secretary of the State Susan Bysiewicz and Rep. Chris Murphy. However, in his speech to the New Canaan DTC, Tong seemed unfazed by his competition and focused on that challenge ahead. "I want to thank you again for, first of all, supporting me over these last three terms. You know together we took a seat that had never been held by a Democrat in its history," Tong said. "You know, nobody thought we could win that race. When I first had clam chowder with Beth Jones (current Town Council member and Democratic candidate for Selectman) in 2006, it was really uphill and Beth said, `You know, give it a shot and knock on those doors and see what happens.' And 6,000 doors later, and a lot of mail and a lot of hard work, we won that race. And this year, for the first time ever, we won in New Canaan, which was a really special moment for us. So I want to thank you all for getting me to this point and I hope you'll take me a little further." Before entering the Senate fray, Tong had lunch with Jones and several others in New Canaan again to discuss the race. "We talked about this race and whether it needed another candidate, whether it was missing something, somebody to shake it up, somebody with an exciting story, somebody with a real message," Tong said. "The more we talked about it, the more it made sense. You know there is too much at stake in this race for it just to be a foregone conclusion. There is too much at stake for there not to be a real competition and for there not to be a real choice. You know the U.S. Senate map for our party is really tough this year. Every day you see Republicans getting more aggressive and even bolder. We're seeing it in this town right now. I mean it is a full blown civil war. We see it in Washington and the way that they're negotiating with the president and with our Democratic friends in the Senate and in the house. And this economy is still slow to recover for small-business people." Tong specifically cited his experience with the Banks Committee in the General Assembly and explained why some financial institutions are not taking risks with small businesses. "You know our community banks, still to this day, are not lending in a meaningful way into small businesses. Why? Well there is the aftershock of 2008, 2009 but in large part there is so much uncertainty and confusion and frankly, what's happened under financial reform is all financial institutions have been painted with the same broad brush," Tong said. "These community banks are afraid to make those critical investments to extend that credit ... or take the risk that we need people taking in this economy. That's the kind of thing we need to change in Washington. That's real and that's substantive and that's what needs to happen." Tong also spoke at length about his story and specifically about his belief in the American dream. The dream which he wants to reinvigorate, he said. "We need to get our confidence back in this country. And a lot of you know my story. You know that I worked side by side with my parents in our Chinese restaurant as a kid. You know that my dad came to this country with just 57 cents in his pocket. He was a cook in a Chinese restaurant and he met my mom in the Hong Kong Kitchen in Bloomfield and they decided that they'll make a go of it. They'll open a Chinese restaurant and try to pursue their piece of the American dream and when they were young they had every confidence they could do it," Tong recalled. He explained how, as he got older, the business got tougher and tougher and his parents had to rely on him and his sisters much more. "They had to call on me and my sisters," he said. "I learned to cook almost everything on your standard Chinese menu. I learned to wash dishes and wait tables and be a part of that effort. ... We had this confidence that if we just worked hard, if we stayed focused, if we stayed together, that my sisters and I would have better opportunities than our parents, and that we, as a generation, would do better than they did. Now about 18 months ago, I started hearing for the first time people say that they don't believe that anymore in this country. That they don't think they can do better for themselves and their families and their children. I'm running for the U.S. Senate because I know they can." Tong believes the example of his political career and his family is proof of the value of the American dream. "I shouldn't be standing here today. I shouldn't have beaten Donnie Sherer in 2006 but I did. It's proof of what is possible. I know it because I live it everyday, but I also know that we have to fight for it," Tong said. "And I've decided to run for the U.S. Senate because someone has to go to the senate and make sure it's a fair fight because it's not a fair fight for a lot of people today."